A 2017 theory proposed by Rice University physicists to explain the contradictory behavior of an iron-based high-temperature superconductor is helping solve a puzzle in a different type of unconventional superconductor, the "heavy fermion" compound known as CeCu2Si2. That year, a team led by Max Planck Institute's Frank Steglich, a co-author on the PNAS paper, found that CeCu2Si2 became a superconductor at extremely cold temperatures. The mechanism of superconductivity couldn't be explained by existing theory, and the finding was so unexpected and unusual that many physicists initially refused to accept it. 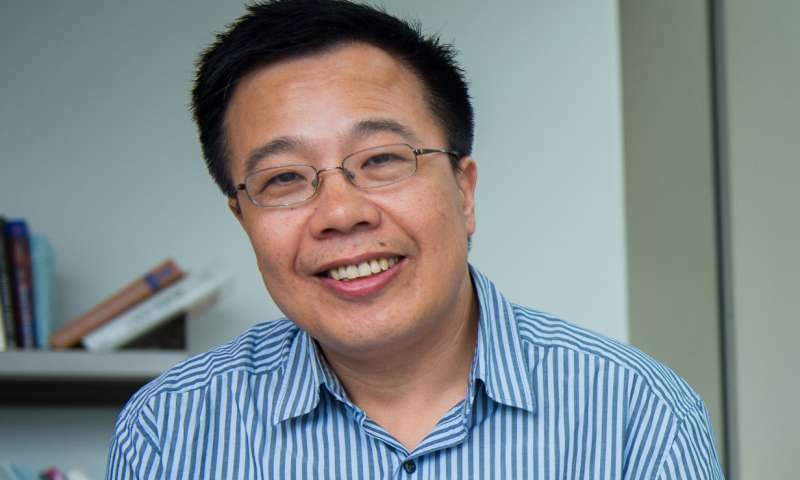 The 1986 discovery of superconductivity at even higher temperatures in copper ceramics crystalized interest in the field and came to dominate the career of theoretical physicists like Rice's Qimiao Si, a PNAS study co-author and the Harry C. and Olga K. Wiess Professor of Physics and Astronomy. Si, whose decadeslong collaboration with Steglich has led to almost two dozen peer-reviewed studies, said, "In my wildest dreams, I had not thought that the theory that we proposed for the iron-based superconductors would come back to the other part of my life, which is the heavy-fermion superconductors." In 2001, Si, who also directs the Rice Center for Quantum Materials (RCQM), offered a pioneering theory that these phenomena arise at critical transition points, tipping points where changes in pressure or other conditions bring about a transition from one quantum state to another. At the tipping point, or "quantum critical point," electrons can develop a kind of split personality as they attempt to straddle the line between states. "Our unifying understanding is that if two electrons work really hard to repel one other, there can still be an attractive force," Si said. "If I am moving because I don't like being close to you, and you are doing the same, and yet we cannot be too far apart, it becomes a kind of dance. The pairs in high-temperature superconductors move in relation to one another, not unlike two dance partners that spin, even as they move together across the dance floor." The 2017 theory put forward by Si and then-graduate student Emilian Nica, now a postdoctoral research associate at the University of British Columbia's Quantum Materials Institute, posited that selective pairing within atomic orbitals could explain some puzzling experimental results from some of the highest-temperature superconductors, alkaline iron selenides. Some experiments had shown that the pairs in alkaline iron selenides behaved as if they had an angular momentum of zero, which physicists refer to with the term s-wave, while other experiments indicated the pairs had an angular momentum of two, which physicists call d-wave. This difference is profound because angular momentum is a fundamental identifier for electrons. Just as apples and oranges are found in different bins at the grocery story, s-wave and d-wave pairings don't mix and are found in different materials. "What Nica's thesis introduced was that you can have a superconducting state in which electron pairs associated with one orbital of a subshell are very different from those of another closely related orbital in the same subshell because they have an opposite sign," Si said. "The reason we proposed this multi-orbital pairing state was because measurements of some things, like magnetic responses, would show that the alkaline iron selenides had canonical d-wave features, and other measurements, like angular resolved photo emission, revealed attributes associated with s-wave superconductors. "The experiments in the iron-based superconductor had already been done, and we offered an explanation, a pairing state that was both stable and robust, and yet had all these seemingly contradictory properties that were experimentally observed." Si and Nica's theory predicted that experiments would reveal a specific set of seemingly contradictory measurements from CeCu2Si2, provided the material could be cooled to a temperature even colder than the tipping point that brings about superconductivity. Yuan's group performed the experiments and confirmed the prediction. "Historical evidence has always been that the pairing in this material is d-wave," Nica said. "But the experiments confirmed that indeed, despite all the overwhelming evidence that it is d-wave, it has a feature called 'fully opened gaps' that is normally associated with s-wave superconductors. Ours is the only theory offered so far that can account for this." Si said, "It's enormously satisfying on several levels. One is that while condensed-matter physics offers many materials that can host fascinating properties, we ultimately are seeking unifying principles, especially as theorists. I have actively searched for these unifying principles for years, but we weren't actively seeking a unifying explanation when we proposed this theory. To see it applied, to such effect, in another completely unexpected setting was a real surprise."